Piso Fare Promo 2016 to 2017: To all our readers and audience of this blog, this is time for you to rejoice especially if you're from the Panay region. 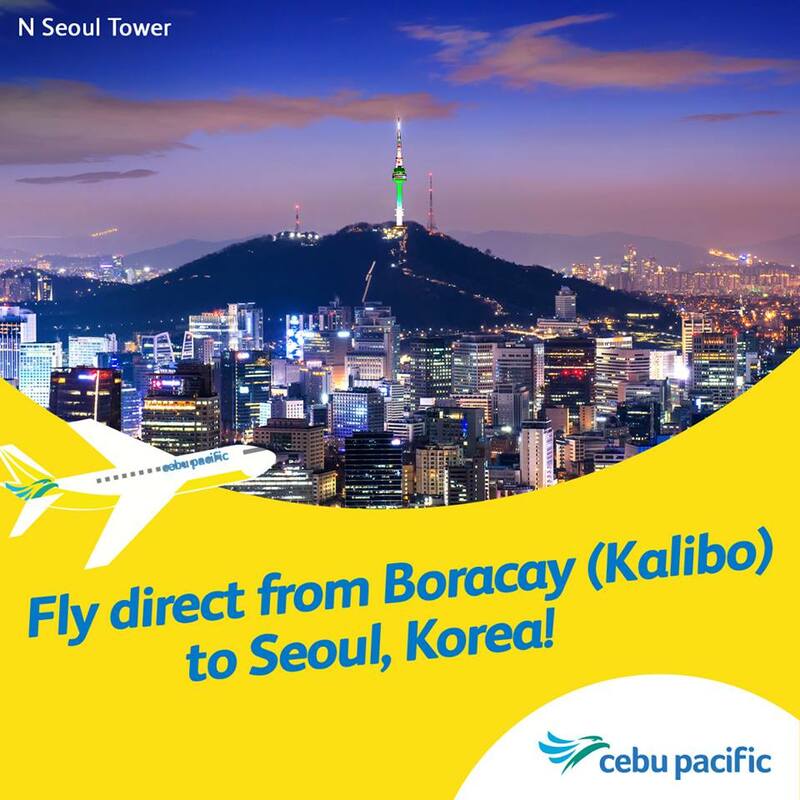 Cebu Pacific will launch their new direct flight to Incheon (Seoul) from Kalibo, Aklan effective October 1, 2016. They will allocated their 180-seater Airbus A320 aircraft. For the flight schedule, it will be DAILY. It will depart Kalibo at 1:50 am, with ETA in Incheon at 7:10 am. The return flight will depart Incheon at 7:55 am, and arrive in Kalibo at 11:15 am on the same day. I'm sure a lot of Koreans will also be happy with this new flight that will bring them to the pristine waters of the Boracay island. To introduce the new route, CEB is offering a seat sale for as low as P1999 for Kalibo – Incheon flights, for travel between October 1, 2016 and March 15, 2017. Travellers who wish to take advantage of this promo fare may book their flights starting today until July 31, 2016, or until seats last. The promo fare is inclusive of country-specific taxes and fees, while bags, meals, and other ancillaries may be added as preferred. "Cebu Pacific gears toward bringing travellers for business and leisure to magnificent countries at the lowest fare in the market. The new Kalibo-Incheon route opens opportunities for passengers to explore must-see places in Incheon such as Wolmi-Do Island, Landing Memorial Hall and Jeondeungsa Temple, among others. We will remain committed to exploring more routes to cater to more passengers and to beef up economic, trade and tourism in this destination," says Atty. JR Mantaring, CEB Vice President for Corporate Affairs. CEB also operates daily flights to Incheon from Manila and Cebu, and four times weekly to Busan from Manila. The airline recently announced that it flew over 10 million passengers from January to June this year, with South Korea as one of its largest short haul international markets. The airline offers flights to 36 domestic and 30 international destinations, covering an extensive network that spans Asia, Australia, and the Middle East. Its 57-strong fleet is comprised of seven Airbus A319, 36 Airbus A320, six Airbus A330, and eight ATR 72-500 aircraft. Between 2016 and 2021, CEB expects delivery of 32 Airbus A321neo, 2 Airbus A330, and 16 ATR 72-600 aircraft.